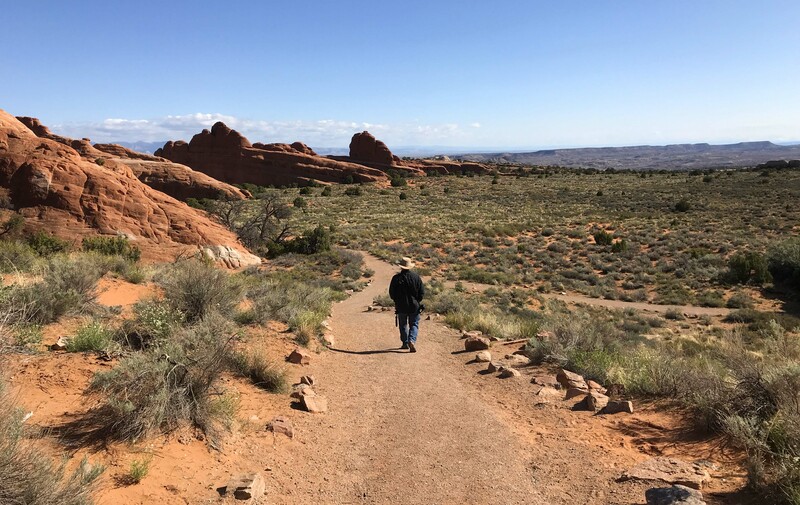 We originally planned an eight mile round trip hike in Arches National Park but despite the mild temps in the morning I just didn’t feel up to it. Part of that was I was a little worried about breaking in my new hiking shoes on what the park ranger said was a “rough “ hike, and partly I was just feeling tired from the pace of the last couple of weeks, so instead we decided to compromise and walk the easiest part of the Devil’s Garden section and see how it went from there. 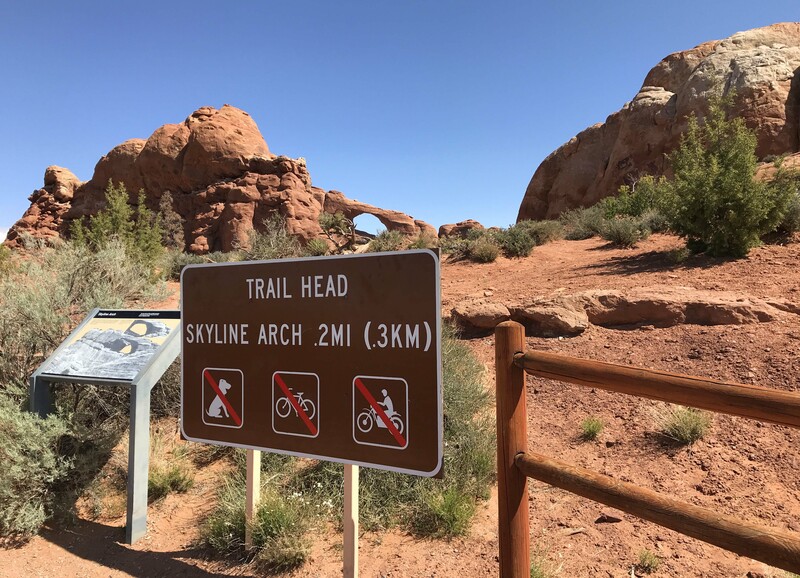 I also knew I wanted to do Skyline Arch, which as an easy .2 mile hike, and there was a 4X2 friendly unpaved road in the northern part of Arches I really wanted to check out. 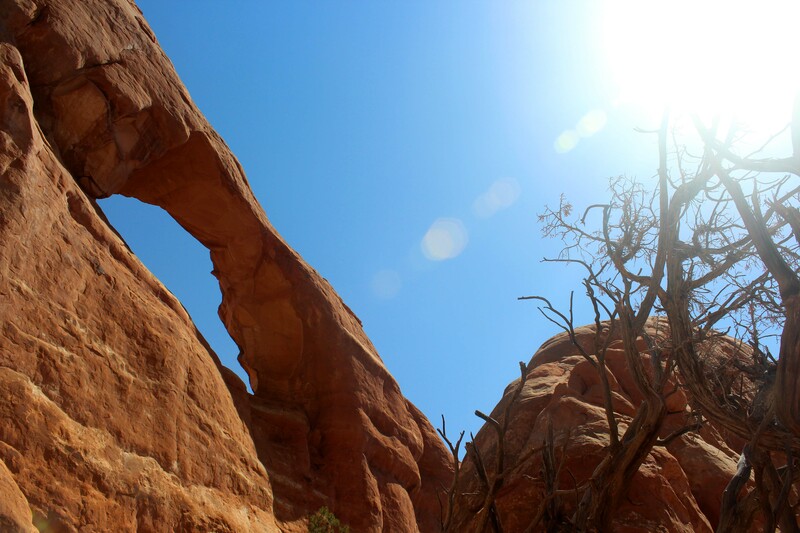 We got to Arches at 9am and since it was a Saturday we were a little concerned about crowds. The line was actually lighter than it was the last time we came, with about 15 cars, so we drove in and headed straight to the back of the park. It took a while to get back there, and despite the early hour and the huge parking lot, it was pretty crowded. There are several multiple hour hikes that originate from this spot and that usually results in parking spots being taken for several hours. I have to say in these scenarios I appreciate the shuttle bus system that Zion offers. We didn’t have any trouble finding a spot, but I am sure anyone who arrived much later in the day did. The parking lot around 9:20. You can see to the left how far it goes. I took a pic of this camper van because we have been seeing them everywhere. This is a new way for younger couples to try out camping and they seem very popular. I’m not sure I would try and sleep four in one as advertised though. 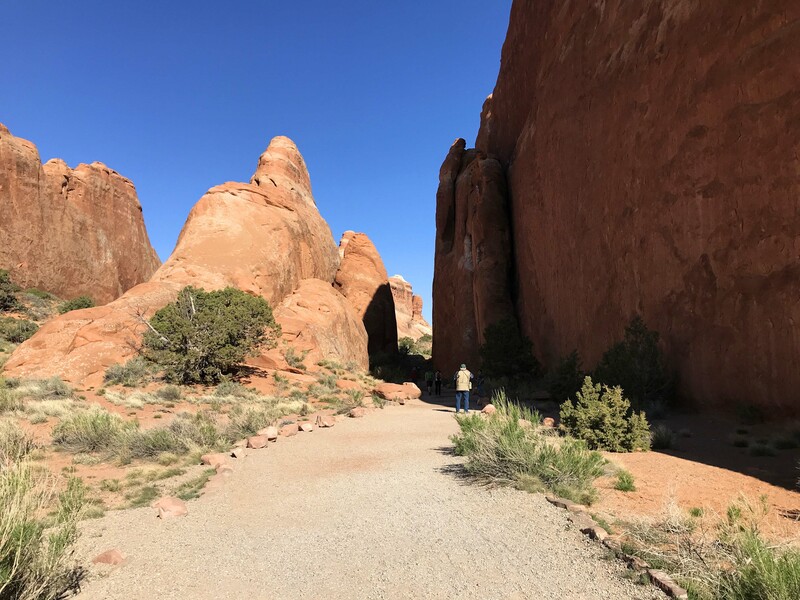 The entrance to Devil’s Garden is the same for multiple arches and the first part of the path is well maintained. It is somewhat steep in sections, but extremely pretty and I absolutely recommend walking it as long as you feel you can. 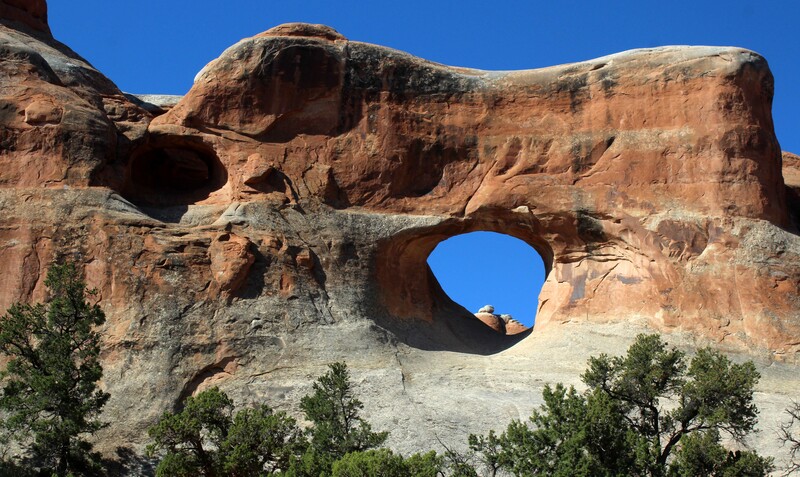 The first turn-off was to see tunnel arch and then pine tree arch, so we made that turn to walk down a hill. 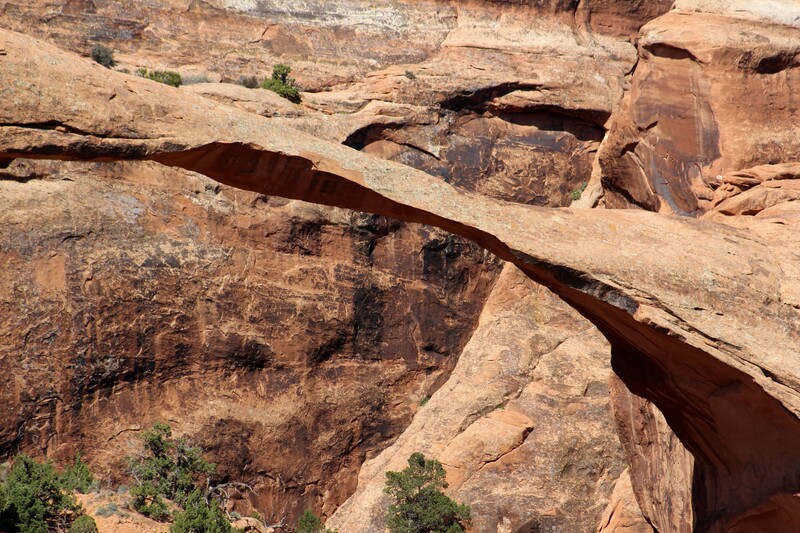 Tunnel Arch was just so-so, you can’t really get very close, but Pine Tree Arch was one of the best we had seen so far. By this time there were lots of people on the path, and while we were walking back up to the main trail, I actually got ran into by a young student who was with a large group. We actually saw several groups from one of teenage girls to a group of walking moms, along this trail and it definitely brought the noise level above what we generally like on our hikes. You can see me in the lower left for scale. I was glad I brought my hat because it was full sun that day and little shade along the walk. It really was a beautiful hike and the surrounding landscape was gorgeous. It was characterized as easy, but I would call it more moderate because I was breathing pretty deeply when we walked back up to the main trail. 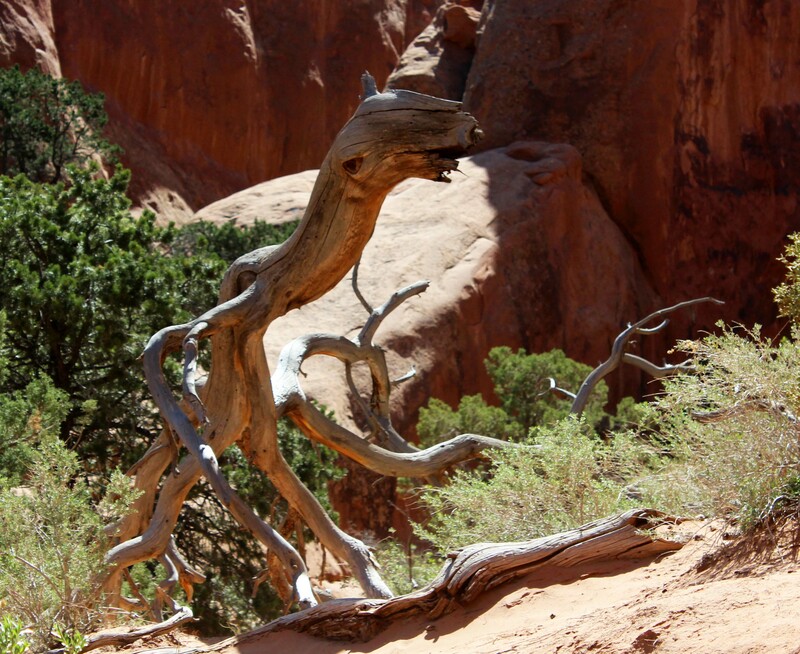 This one looks quite a bit like an alien to me. Give it a minute…see the eye at the top and the tendrils underneath. Even looks like it is smiling a little. This was about the normal traffic level on the trails, some separation but still lots of people. Wasn’t too bad as long as we stayed away from the bigger groups. 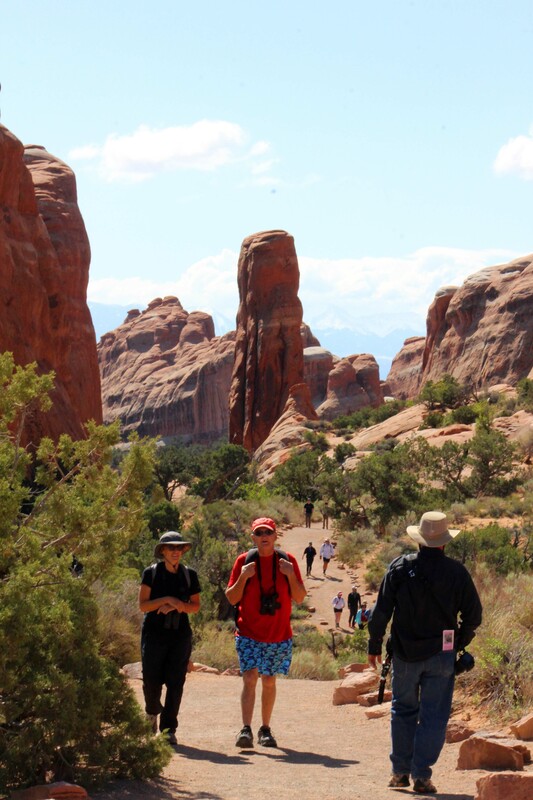 As we continued on towards Landscape Arch we left most of the groups with smaller kids behind, because the path was a little rougher. 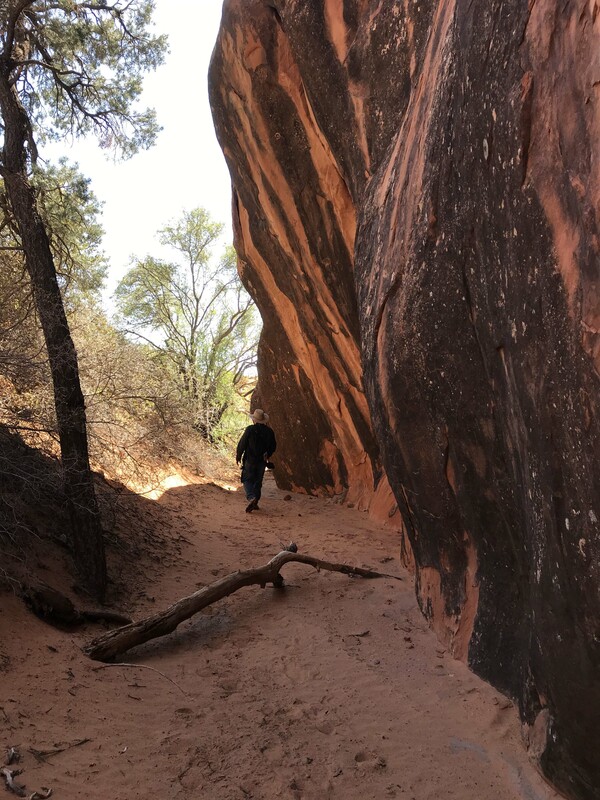 Right when we got to Landscape Arch itself the path turned “primitive” to deep sand, and at that point I decided I wanted to go back. I’ll take walking on rock any day over deep sand, and although there were two more arches within another .8 miles, I didn’t want to push it. I had learned about myself the last couple of weeks that I have a tendency to agree to keep walking and then I was getting angry because I didn’t say no to begin with. That wasn’t fair to Lee, and it is definitely my responsibility to know my own limits, and I had also proved to myself that under the right conditions I was fine with walking for miles. 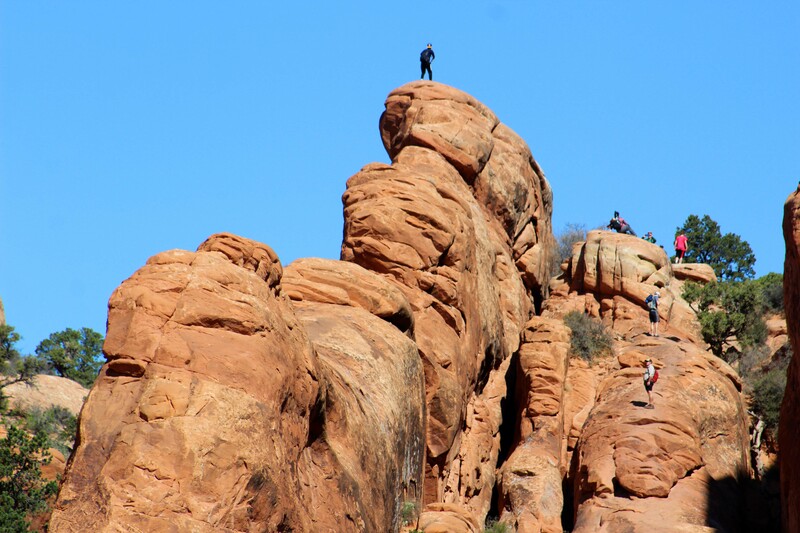 Crowds, heat, elevation changes, and ground conditions are all factors in the equation and .8 miles in deep sand is NOT the same as .8 miles on a relatively smooth walkway. 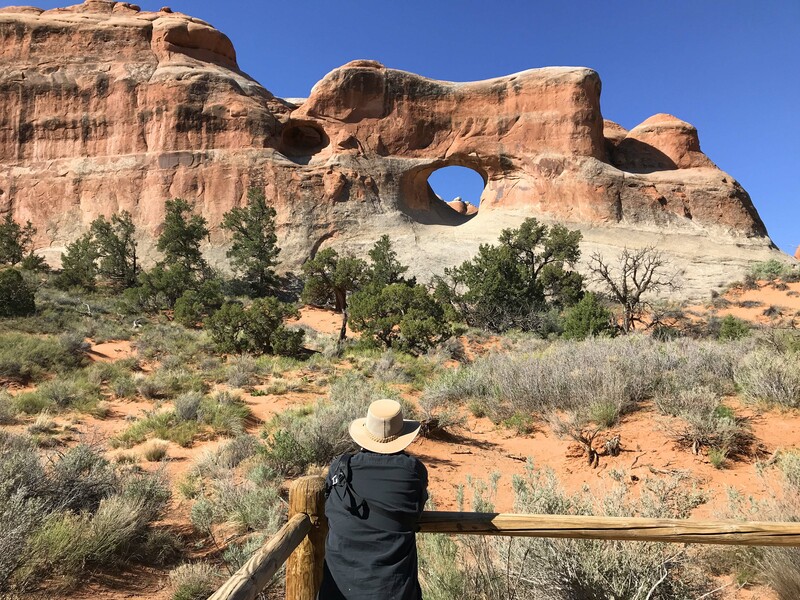 Lee could have kept going (he almost always can), but he agreed to turn back, but prior to that we did spend quite a bit of time at Landscape Arch which was very different than the other arches we had seen and had a cool story. 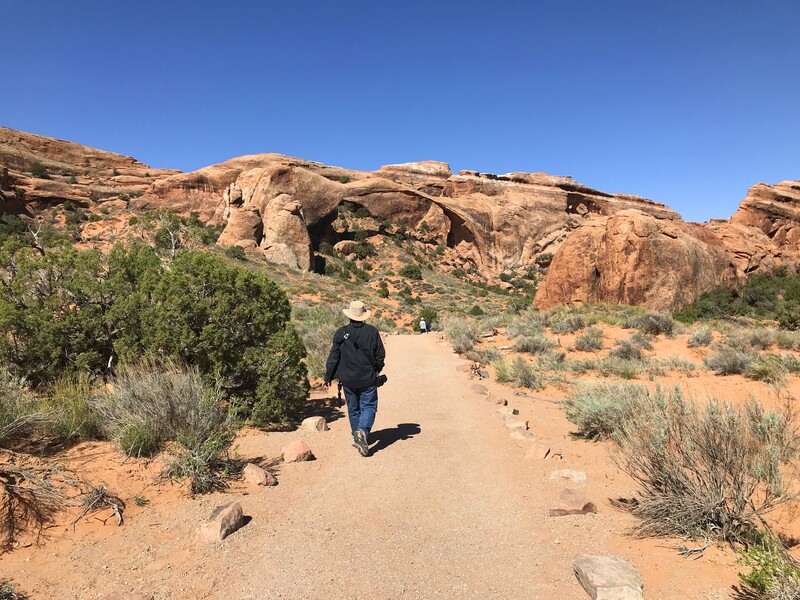 Lee walking up to Landscape Arch. You can see it in front of him. The path goes to sand around the corner. Here’s a better picture. You can see on the right hand side it’s quite a bit skinnier and I was glad I read the signs that told why. I almost missed them. 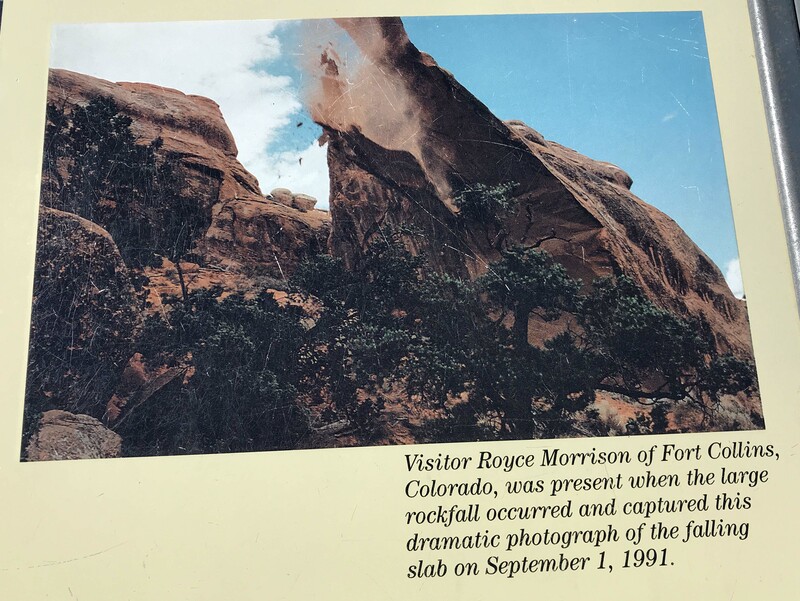 In 1991, while people were under the arch a 60-foot long slab broke loose and fell down. Thankfully no one was hurt. 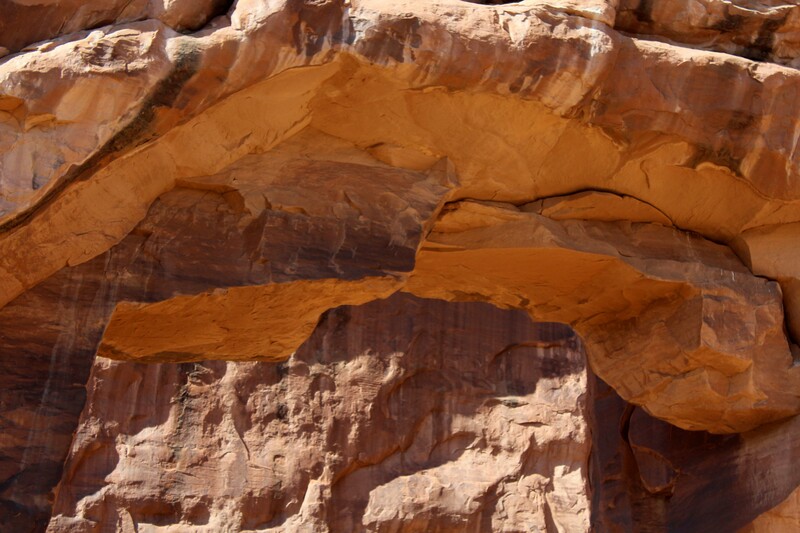 They think it was caused by water getting into the cracks and then freezing and expanding, but it shows that these arches are not here forever. This photograph of the event was captured by an amateur photographer who just happened to be there in the moment. Good for him for getting the picture under pressure and how cool to have some of his work be forever part of the park. 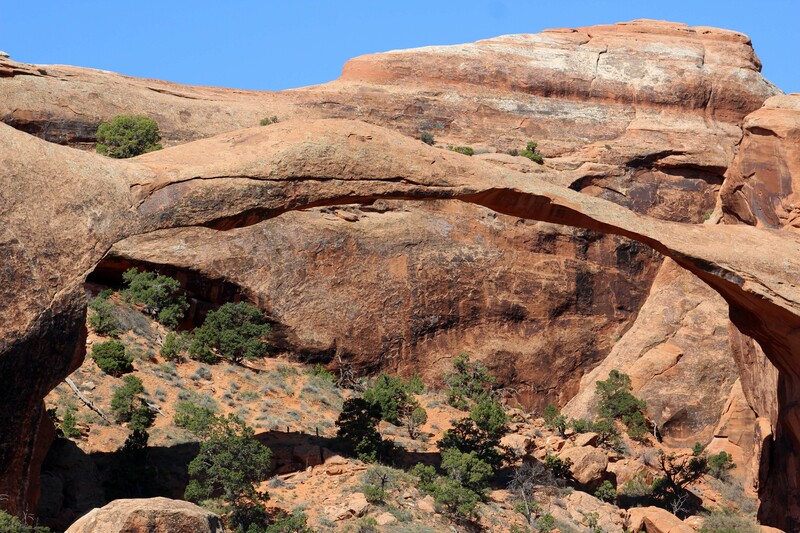 Because of the incident, you can no longer walk under this particular arch, but we did see several climbers pretty high up on the rocks nearby. It’s not really clear to me where it’s safe to climb and where it is not, but the locals seem to have a good handle on it. I also was finally able to get a picture of one of the numerous songbirds I kept hearing. They had a beautiful song, but are pretty tiny, so I didn’t see them until this one landed on a far away branch. 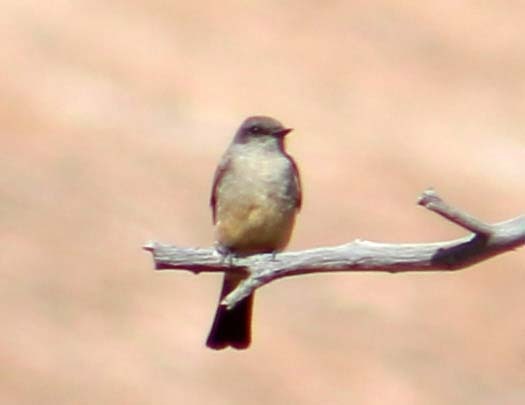 I’m pretty sure it was a Say’s Phoebe. 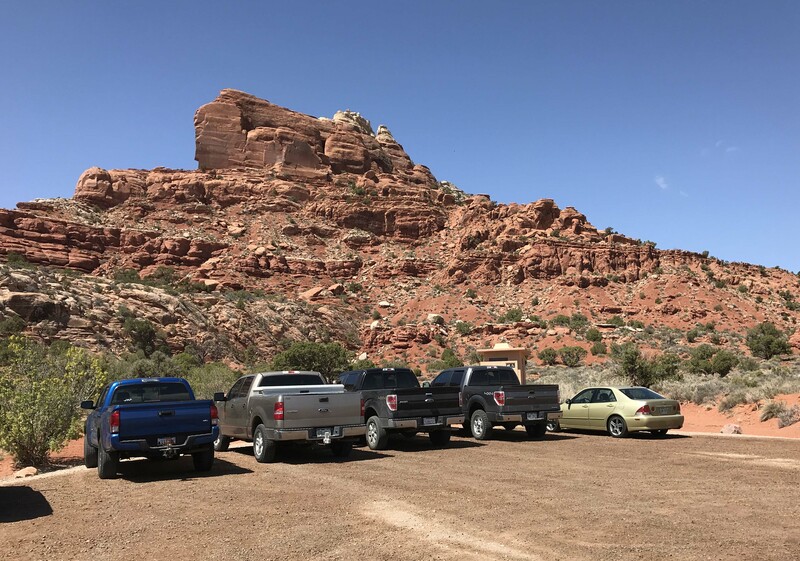 After we walked back to the parking lot (much shorter when we didn’t take the side trail to Pine Tree Arch), we saw the parking lot was completely full. Folks were leaving and new people coming in, but by 11am there was a small was to find a spot. 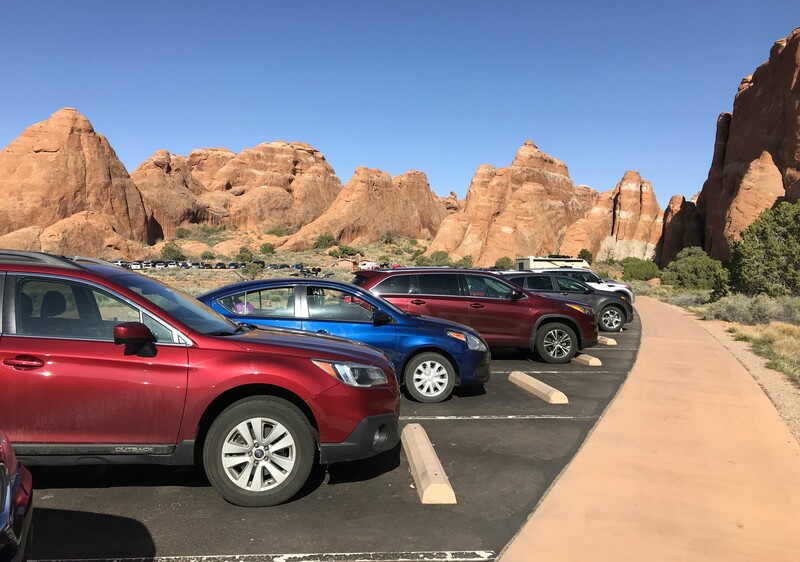 We drove down to Skyline Arch next, which had a very small parking lot and we were able to find a spot. 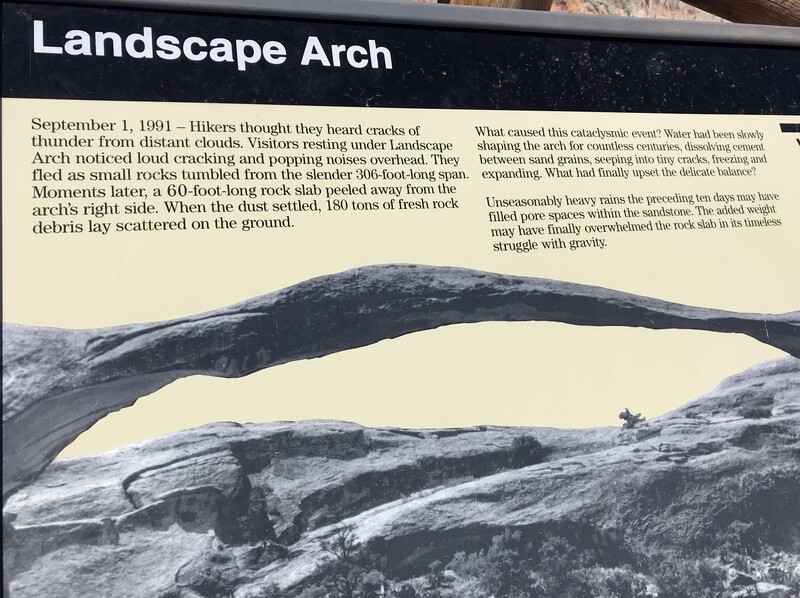 I was really surprised by this because this arch was a really nice one, but maybe since you could see it in from the road, people don’t walk back. 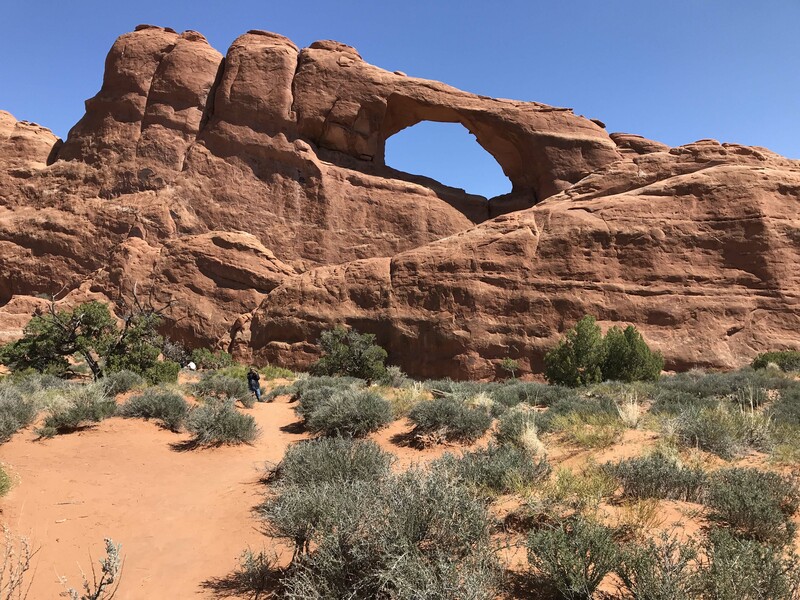 The initial short climb to get up a hill was on sliprock, but then the trail levels out and despite the fact the arch is up high, I thought it was definitely worth the walk. There were just a few of us on this trail, and you could walk back and see the huge rocks where parts of the middle section had fallen down, and I just thought the whole thing was really cool. 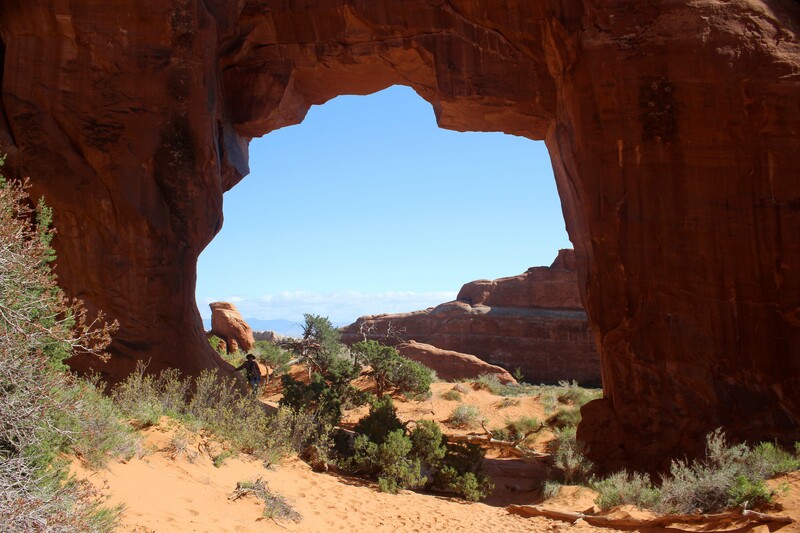 Skyline Arch from small pullout. You can see it right over the sign. And I was lucky enough to catch a cloud as it passed behind the arch, which made for some pretty pictures. It was really photogenic, as this pic from Lee shows. 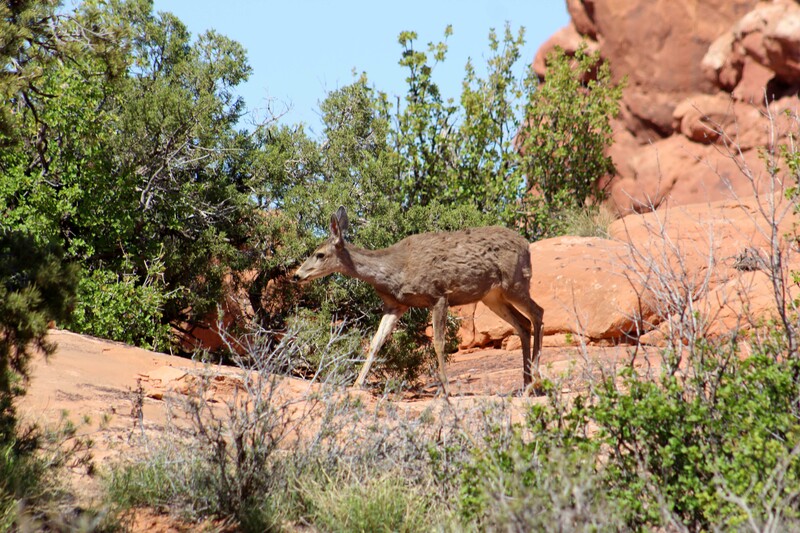 The best part of the walk was that as we were walking back, Lee noticed a mule deer pretty close to us. 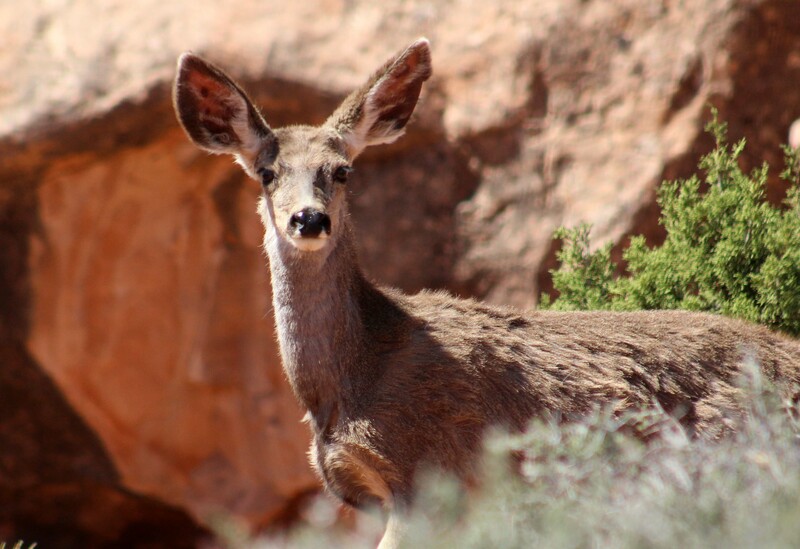 These were the first mammals we had seen in any Utah park and there was a group of five of them that allowed us to get pretty close. They were very focused on eating the new leaves that were sprouting and we spent a ton of time watching and taking pictures of them. 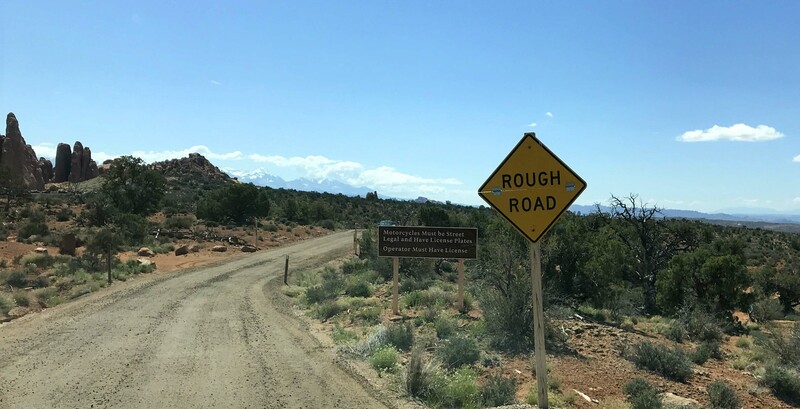 After we left Skyline Arch, we got on the Salt Valley road and headed to the northwest corner of the park. This drive was mostly flat in a valley, but there is a small section of rocks up in that corner at the Klondike Bluffs. When we saw the sign we made a left and went to the trailhead, which was somewhat full, but after looking at the steep trail and reading a description we decided to continue down the road. As you can see the road was well maintained in the park. Klondike Bluffs trail head. From the stickers on the vehicles it looked like this was a popular spot for serious hikers. At this point we could have gone back through the main park, but decided to chance it and see where the road went. The Park Ranger had sort of vaguely said she thought it ended up on HWY 191, but that wasn’t exactly the case. Lee had reset the tripometer when we first got on the road, so the mile markers are from that spot, and he was using Apple Maps satellite view to see where the roads went to navigate us, since once we left Arches there were no signs to speak of. Surprisingly we had good cell coverage during the entire trip, especially as we got closer to HWY 191. It is worth mentioning that the road condition definitely worsened once we left the park, but it was definitely doable for a car at least, although I would be very careful how far I brought a big rig back in there. We did see people camping in tents in some amazing spots. I assume the land is public, although it wasn’t posted anywhere, as there were definitely signs of use. At MM 15.3 the road forks left and for some reason I felt like we should turn. We stopped there and Lee checked the road and verified that although the turn road didn’t go straight to 191 it got us close. We followed that road, which was actually rougher than the one we were on, and when it reached a dead-end we made another left. This took us to Klondike Bluff Road which was right off HWY 191 and we were able to get right back on. 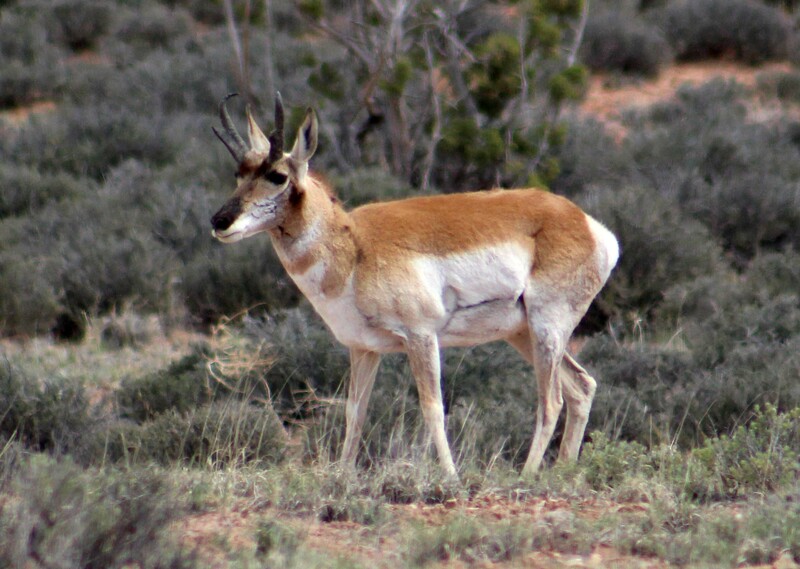 One cool thing about exploring the area, is we had our first up close and personal encounter with an antelope. We have seen groups of these off in the distance, but this one was close to the dirt road and allowed me to take some pictures with the long lens. Lee wanted me to get closer, but I was having none of that. It was a male and had it’s horns in and I was just fine with the distance I had. Cool moment though, especially because we had seen the mule deer earlier in the day. All in all it was a nice day, although we hiked less than we originally thought we would. We are definitely slowing down at this point, and I was more than happy to have a day where we got back by 12:30pm. We have decided to leave on Tuesday, to give us some extra time to get to Oregon, so only have a couple of days left. I’m going to look over the list of the things we have left to do and pick a couple for tomorrow. 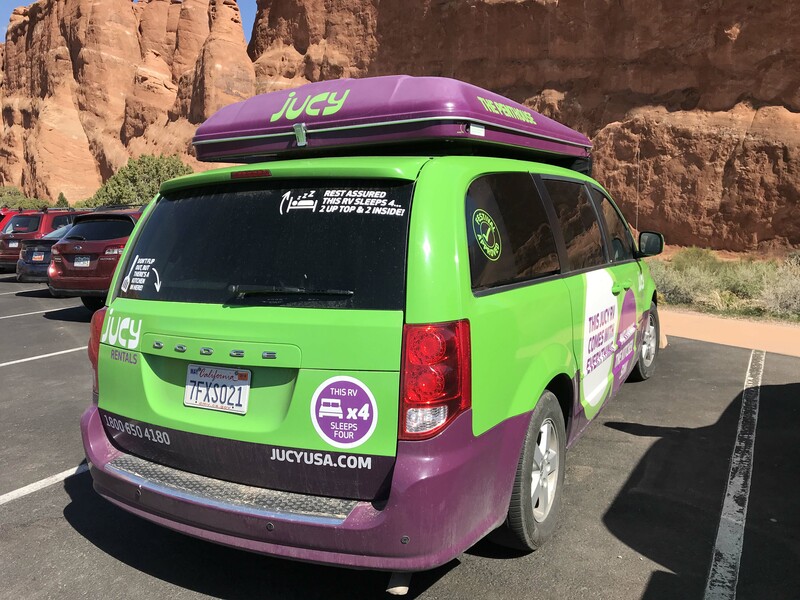 This entry was posted in Lakeside and tagged Devil's Garden arches National Park, Klondike Bluffs, Landscape Arch, Pine Tree Arch, Salt Valley Road, Skyline Arch, Tunnel Arch. Bookmark the permalink. ← Laundry Day, Scenic Drive, And Finally A Day Off!! Beautiful! Love those arches. 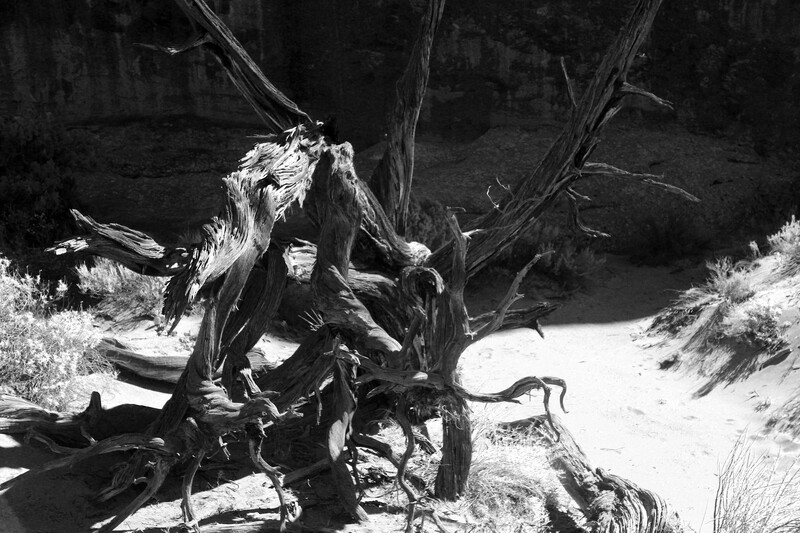 For some reason I’m drawn to black and whites of dead trees too. So dramatic effects. Cute deer. When I was looking at your first pictures of the underside of Tunnel Arch, I thought…looks like parts of that could come crashing down!!! 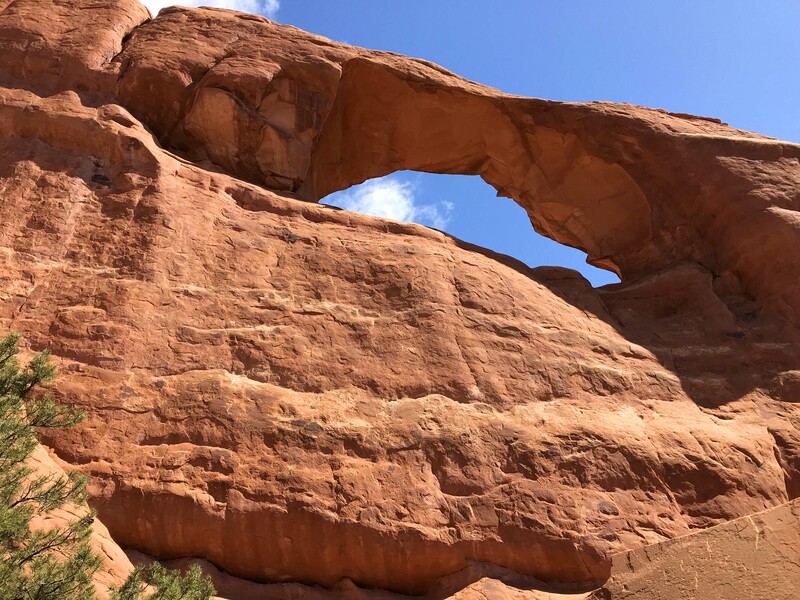 Then to read that they had at Landscape Arch and people were there gave me a healthy respect for the beauty we hope to see:o)) Just loved the landscape photo from Salt Valley Road…so many layers!!! 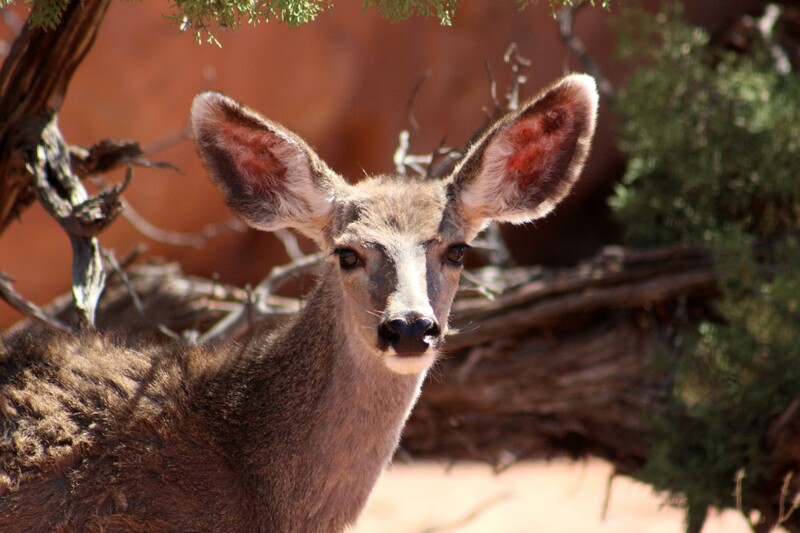 Really enjoying all your posts and they have really been a wealth of info for our 2019 Trip West….Thanks!!!! Awesome views, valuable information and very descriptive for those who are in the planning stages of trips there! You 2 have really done a great job describing your stay and the picture’s and video’s really help put it all into perspective ! Thank you ! We decided to leave here June 17th for 2 months out there and I can’t hardly contain myself till then! I feel that because of you two we are ready, and going with our eye’s wide open !! Thanks Tracy and Lee !! Oh thanks so much. That’s exactly what I was hoping for and so glad it was helpful! !